Road To to Rome replicates battles of the allied campaign in Italy. From Operation Husky (landing in Sicily), up to Monte Cassino and the monastery in the mountains. 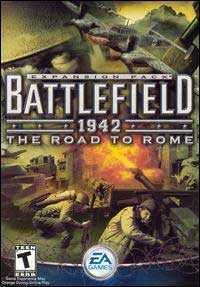 Road To to Rome functions only in with the original Battlefield 1942. It offers 6 new Maps (also Anzio, Salerno, Santa Croce and operation Baytown), Italian and French allies (who are heard spoken in their respective national language and with subtitles translated), as well as matching weapons and vehicles. Now on the battlefields more possibilities of healing are found, more often medicine boxes are found near important positions and close to ammunition boxes. The crosshair was reworked, now this eases recognizing from hits or misses. The AI was improved all together, nevertheless, is not still flawless. Road To to Rome is a high-class addition to a high-class game, indeed it does not offer altogether a lot of new things, but there wasn't a lot there in the original to improve on anyway.